Is it a bird? Is it a plane? I dunno, but it's a nice voxel. I just wonder what makes a transport transport. It’s more like a aircraft design question. The "UH" in UH-60 Black Hawk is a short for utility helicopter, from it's name it's giving you the impression that this type is purposed to serve various missions targets I.E evacuation and ground attack and supporting teams on the ground in the same time, and isn't it obvious that attack helicopter has a thin hull and the two seats are back to back! the voxel seemed to be small, so i resized it, i have edited also the hva, after all seem to be finished, expected as it was made, i have put both vxl. and hva. 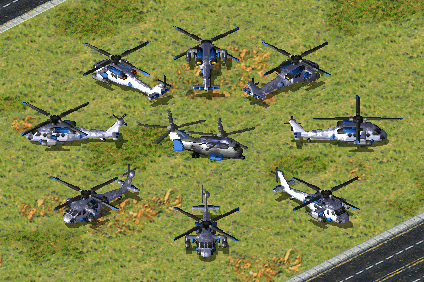 resized in the game folder, as i have proceed to testing ingame, the voxel is nowhere to be seen but the shadow of the main rotor, as i have clicked the unit to move, my game crashed. what can i do to resolve this? what seems to be the problem? To start with, you could share with us your rules and art code for the unit.